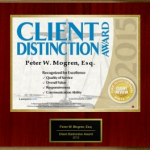 Awards - Mogren, Glessner & Ahrens, P.S. 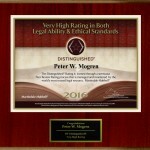 Mogren, Glessner & Ahrens, P.S., is honored to receive awards from our clients, professional organizations and the legal community. Please see some of these awards listed below. 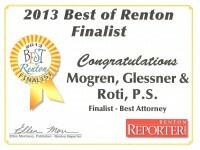 Congratulations to Mogren, Glessner & Ahrens, P.S., for the second year in a row, we have been voted as the Best Law Firm in Renton by the readers of the Renton Reporter. We have been voted as the Best Law Firm in Renton for both 2015 and 2016. We have also just been awarded the Most Outstanding Law Firm of 2016 for the USA by Wealth & Finance INTL. They look for some of the leading, most innovative, competitive and client-focused law firms who have demonstrated truly marvelous things this year. Only the most creative, forward-thinking and truly exceptional of law firms stand out from the crowd in these competitive times. In the modern legal environment both the very niche law firms as well as the international law firms can make a real impact within their jurisdiction(s) or specialist area(s), meaning that firms of all sizes have been considered. 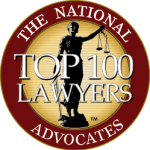 In addition, we were just selected as a top 20 best divorce lawyers in Seattle for 2016 by Expertise.com. Each year The American Registry recognizes the “Best of the Best” – the CEOs, doctors, attorneys, wealth managers, brokers, entrepreneurs, contractors and individuals from just about every industry and profession. Only those who have been publicly awarded multiple times for their professional excellence by trade groups, peers, clients, and the press are even considered. 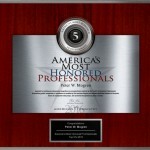 Out of hundreds of thousands of professionals evaluated and researched by The American Registry, we are proud to announce that in 2016, both Peter W. Mogren and Ronald E. Glessner, partners of our firm, have been recognized as one of Americas Most Honored Professionals. Mogren, Glessner & Ahrens P.S. has served the King County, Washington communities since 1942 and received the awards below. We are conveniently located at the intersection of I-405 and SR-167.